The Children’s Education Department of Christ UMC, Farmers Branch held the first summer children’s camp this summer, Rock Around the Clock. The camp was held for one week, Monday through Thursday. Monday they learned about the 50’s, Tuesday, the 60’s, Wednesday, the 70’s, and Thursday, the 80’s. Each day they had cooking, drama, P.E., art, science, and music classes, based on the day’s theme. In art class one day, the children went into the sanctuary. They each picked a number out of a bowl and were assigned that station of the cross. The children were given five minutes to study their station window in the sanctuary. Then the children went outside the sanctuary and recreated their window on paper from memory. As I was taking pictures of the Stations of the Cross art display, I recalled a project from elementary school in Wichita Falls. I was to draw the front of our family home from memory. I do not know how long it took, but I finished the drawing. 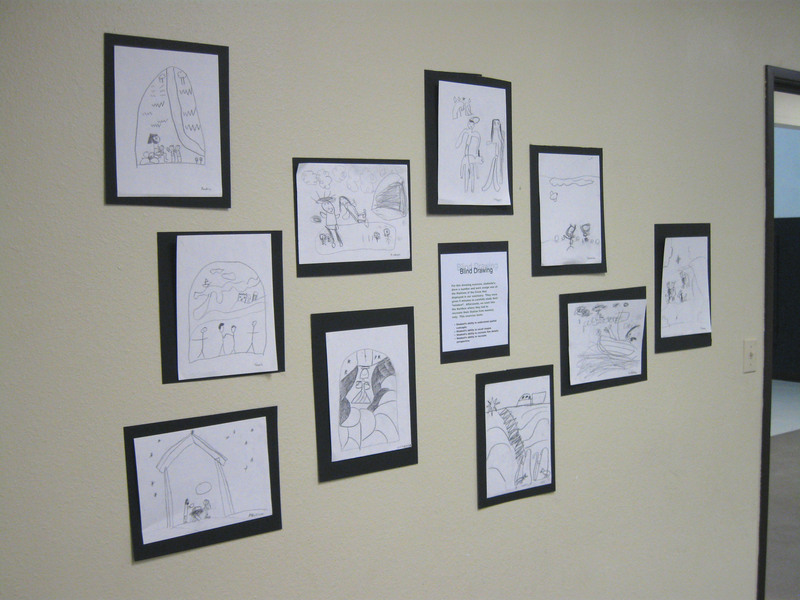 It is highly possible that the drawings were displayed at an open house – as with the art gallery of summer camp projects. When I took the drawing home and compared it to the front of our house, I was “right on the money” – down to the oil stain in the driveway. With the exception of drafting classes in junior high school, along with drawing imaginary funny cars and hot rods for fun with a friend, I never drew anything really decent again. We moved to Dallas when I was in the eighth grade. In high school I began to write, leaving the artwork to those better suited for the task. I can doodle with the best of them, but anything resembling art that results is merely by accident. Our house burned down on the Friday before I began my senior year. Of the many things I lost that night, the picture I had drawn was one of them. My parents recently went back to Wichita Falls and the house we lived in was gone. There was not even any sign that the house had ever been there. All the homes around it were still there and in fairly good condition, considering their age. I had a sinking feeling when Dad told me the house was gone, as if a part of my life was gone. I am left without a visual reminder of our house other than my memory. It is not the first time and it certainly will not be the last. But it does remind me – and everyone when it happens to them – that material things mean nothing as long as we have our memory and faith in God. It is our memory that makes our past experiences special and real. Even if I could take our sons to Wichita Falls and show them the house, they would not have a sense of what it meant to me. It would simply be the house where Dad used to live. But the memory of living in that house will remain special to me. And that is what is important. If my existence depended on the existence of places I have lived and have been to, a good part of my life would be wiped from the annals of history. When the house burned, I lost everything I had except the clothes on my back and a small stereo that I had in the bathroom to listen to while taking a shower. As I stayed at a friend’s house the night of the fire I had a strange sense of freedom. I was not tied down with possessions. Then I would begin to think of everything I had lost and the sense of freedom would turn to sorrow. It has been several decades now since that night. I have stuff again – too much stuff. Between the fire, a couple of robberies – and a rare repossession a really long time ago – I worry about my stuff. I cringe when I smell smoke of any kind except a grill. I’m slightly paranoid about checking the locks when I leave the house. But with relatives, friends, associates, and acquaintances passing away with disturbingly increasing frequency, life – and material things – look a little differently now. Material possessions do not have the allure they did when I was younger. Books that I lugged around for years because I thought I would read them someday are now in someone’s home having been bought in a garage or library book sale. The objects I held onto because “they might come in handy some day,” never came in handy and have been recycled or given away. With each passing day, I make the most of that day and I am thankful that I have my memories. Losing everything from my past in the fire did not mean I lost my past. I remember it, have pictures of some of it, friends and family remember parts of my past. But the emphasis lies on the fact that I remember it. Possessions, houses where I lived, clubs where I played, places I visited – they may be gone – but that does not matter. I have my memories and I can describe them to people. Maybe they can get something out of them. But I remember them, have faith in God, and have an appreciation for the life he gave me. Either things will take care of themselves or God will guide me through them. Anything else is just gravy.